More than 50 percent of books, clothing and consumer electronics are purchased online, accounting for more than $68 billion in package shipping fees last year. 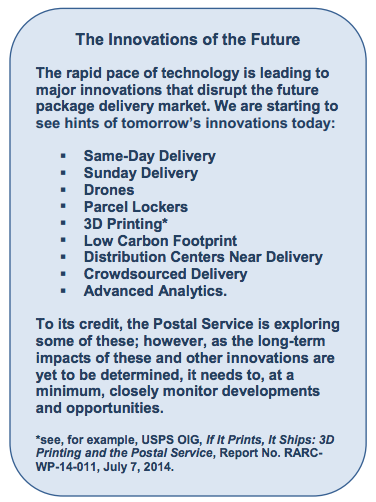 But if the United States Postal Service wants to compete and thrive for a larger share of that shipping market it will need to develop a strategic technology plan, according to a new white paper from the USPS Inspector General. In just four years, shipping costs paid by Amazon have increased by nearly $5 billion, or 274 percent. However, not all of that business went to USPS — the giant online marketplace also ships with FedEx and is at the forefront of researching its own cutting-edge delivery methods, including the use of drones. 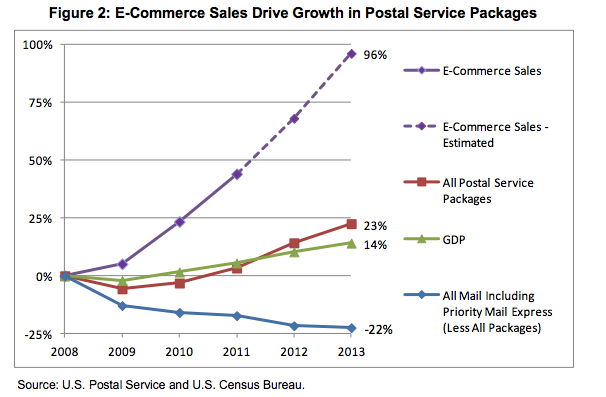 As e-commerce grows, so does the growth in Postal Service packages. In 2013, 17 percent of Postal Service revenue came from packages alone. In fiscal year 2013, packages accounted for 17 percent of total revenue and 23 percent of total cost for the Postal Service, the white paper states. But according to David Yacobucci, a senior economist at USPS’ OIG and a contributor to the white paper, that number will only increase as time goes on. Despite the fact that e-commerce is not a new phenomenon, Yacobucci said there is still an opportunity for the post office to take advantage of the growing market now. The package services market is moving fast due to e-commerce, Yacobucci said; however the uptick in shipping is just an accelerated version of a familiar situation that has been around for decades. But the question surrounding the report is whether the Postal Service can continue to serve as well as it did in the era of catalogue shopping. 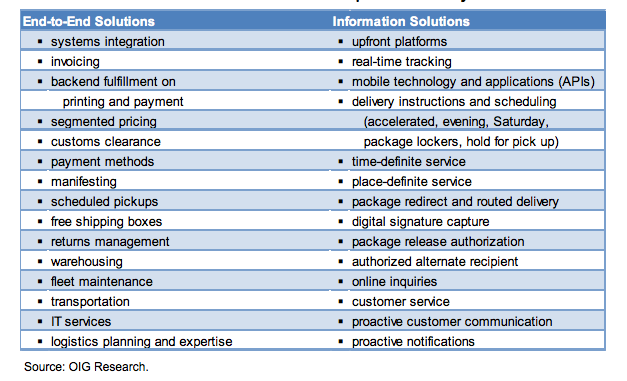 The authors of the white paper found that in order to continue as an efficient and effective provider of package services and shipping for online retail, the Postal Service needs to develop a package strategy that includes building a perception around reliability, investing in its infrastructure, strengthening its role in digital information services for packages and expanding beyond traditional delivery. As companies like Amazon look toward innovative ways to deliver packages, like drone delivery, the Postal Service is looking into options like Sunday delivery and, in some cases, same-day delivery. But that’s not enough, Bill Jusino, a public policy analyst at USPS’ OIG said. The white paper encourages the Postal Service to monitor and study consumer preferences to determine the best services to offer to customers going forward, with a focus on maximizing efficiency and minimizing cost to the cash-strapped independent agency. “Establishing a reputation as the package delivery company offering the most reliable and cost-effective services will help ensure its future as a modern delivery company that meets the needs of 21st century commerce,” it states.